Clean power is the lifeblood of good audio reproduction. Take the analogue electrical signal that appears at the output sockets of a CD player, DAC or phono pre-amp for instance. It’s not just dependent on the quality of the unit’s power supply – it is the mains voltage, stepped down and modulated by the equipment’s incoming music signal. Recognising the clear gains available by using better power supplies, several companies are now making available general-purpose upgrade power units for use with a variety of hi-fi components. This has been inspired in no small part by the proliferation of products that rely on small switch-mode power adaptors – the ubiquitous wall-wart mains plugs. Switch-mode power supplies are small, cheap, convenient and more efficient than traditional linear power supplies. Better in almost every way – apart from the potentially ruinous effect they can have on actual sound quality. They work by converting mains AC to DC, then switching this current on and off at very high (radio) frequencies. This can lead them to broadcast radio interference either through the air or back through the mains line connection. They may not all be universally bad but the cheaper adaptors included with so many domestic appliances, including budget audio equipment, is unlikely to be free of radio-frequency vices either. 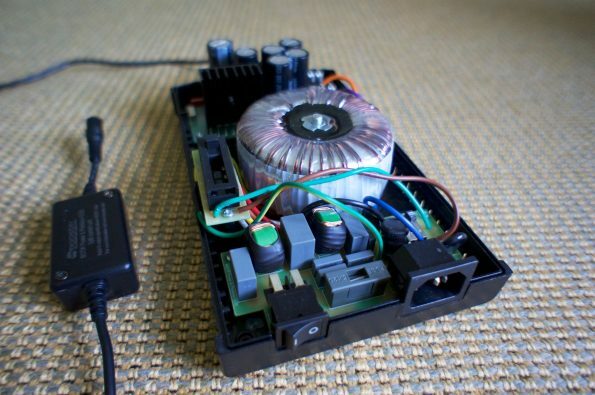 Add in the possibility of not just contaminating the sound of the connected component in question, but of other sensitive audio electronics in the neighbourhood too and it becomes clearer why removing the switch-modes from a hi-fi system has been cited as a way to improve overall sound quality. 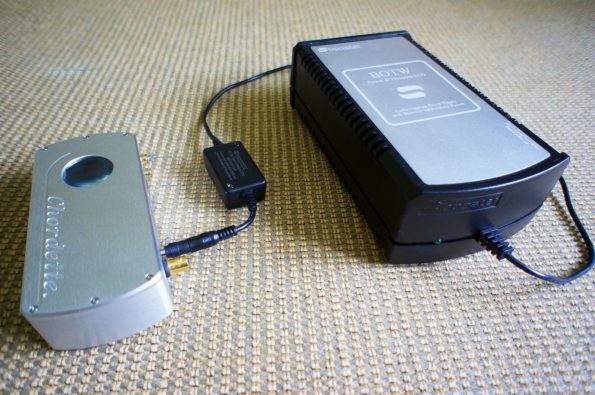 While reviewing the Mytek Brooklyn DAC recently for Hi-Fi Critic magazine Vol 10 No 3 my attention was drawn to some of these upgrade power supplies, because the Mytek convertor includes an auxiliary power input socket. The DAC has its own built-in (SMPS) but this can be readily bypassed with an external 12 V power supply. Mytek provides this option as an easy way to try an alternative power source, perhaps recognising that many enthusiasts remain wary of audio equipment based on high-frequency switching power supplies like that fitted inside the Brooklyn. One such upgrade power supply I tried was the Longdog Audio 2.5 A linear supply, sold by MCRU, which I hope to return to more fully in a separate review. 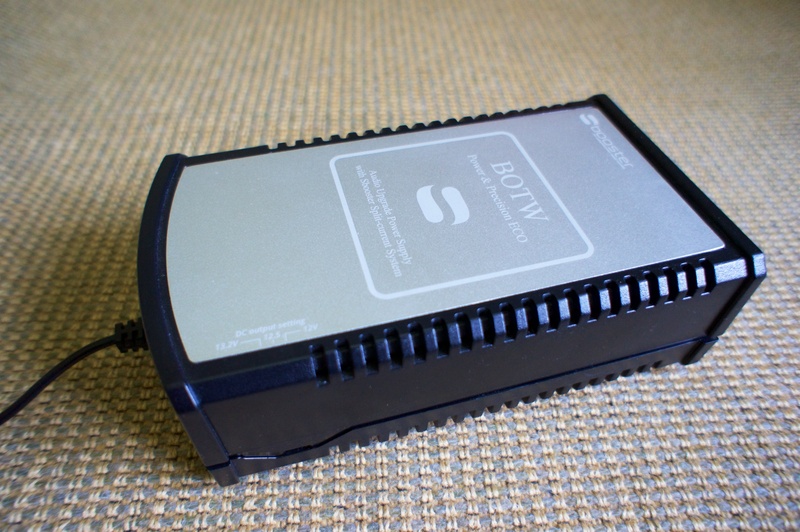 Another power supply suggested to me by Mytek Digital founder Michał Jurewicz was the Sbooster BOTW, which arrived just too late for me to include in the Critic DAC review. It really deserves attention, so here follows a closer look at the unit and how it can affect sound performance. The Sbooster BOTW P&P ECO 12V – 13.2V is the full if unwieldy name of this external linear power supply for the Mytek Brooklyn. The Dutch company behind the design started out with custom supplies for the Logitech Squeezebox and now makes six different versions to cater for a wide range of equipment, depending on required voltage. The current BOTW P&P ECO units are made respectively for 5-6 V, 9-10 V, 15-16 V, 18-19 V and 24 V operation, plus the 12-13 V unit tested here. Three settings are offered for all but the 24 V unit to fine-tune output level, with a three-position switch concealed on one side – in this example, we have 12.0, 12.5 and 13.2 V.
Output current is specified as 3 A for 12 V operation, and 2.25 A when set to 13.2 V, which means the unit is good for around 36 watt – plenty for most audio source components and many other appliances too, of which more later. Decoding the product’s name gives insight into the design philosphy: best of two worlds (BOTW) power and precision (P&P) economy/ecology (ECO). The circuit is based around an inlet filter using small chokes and polypropylene capacitors, followed by toroidal transformer, then discrete diodes for full-wave rectification, and a single voltage regulator surrounded by several bulk electrolytic capacitors. When small size, weight or price are not prime concerns, the linear supply typically beats the switching power supply in almost every area – except economy. Where a SMPS can hit and exceed 80 % efficiency (ie, only 20 % input power lost to heat), a linear supply is usually much less efficient, especially where multiple stages of voltage regulation are used that contribute to making these units run warm. Which is to say, inefficiently. Witness the use of heatsinks on solid-state regulators throughout a traditional high-end linear power supply, there to dissipate lost electrical power that has been turned into heat energy. The Sbooster supply is expensive by the standard of switch-mode supplies at around £260, but is nearly half the price of the Longdog Audio unit, for example. Size and weight are not major considerations for a domestic hi-fi system so a 1.7 kg box the size of a large housebrick (129 x 74 x 223 mm) is also not a problem. And Sbooster claims to have maintained good efficiency by designing the power supply with the bare minimum voltage drop, using high efficiency components. One way to reduce losses is by optimising for the local electric supply, and each unit can be set up to closely match the actual mains voltage, in eight steps adjusted by two internal switches. The first gives coarse switching between ‘120’ and ‘240’ volt operation. The second is a fine adjustment to settle on either 100, 110, 115 and 120 V; or 200, 220, 230 and 240 V.
The mains voltage in the UK is nominally fixed at 230 V AC – but in reality is still at the old 240 V standard, while still conforming to UK government electrical regulations published 2002 which allow to within ±6 % of the nominal value. At my home, for instance, I find line voltage tends to range between around 240 and 242 V AC rms. The Sbooster was already correctly set internally to 240 V operation, and it should be right for any potential purchase too so removing the lid to reset is unlikely to be necessary; but it’s a handy feature that allows user adjustment without having to return to the manufacturer. To see how efficiently the Sbooster was running I tested power draw of the Mytek Brooklyn through three different power supply sources – its internal SMPS, the Sbooster BOTW P&P ECO, and a Longdog Audio linear supply. Using the built-in PSU the Brooklyn measured the lowest, at 13.9 W when powered up, and 4.2 W in standby mode. At the other extreme, the Longdog drew the most power: 23.5 W in use and 6.7 W in standby, so approaching twice as much power in use and 50 % more in standby. The BOTW P&P ECO measured 16.8 W, falling to 4.9 W in standby, figures that are closer to the ‘efficient’ switch-mode supply. These results were with the Sbooster PSU set to 12 V operation. However switching to the higher voltage of 13.2 V, efficiency measured slightly better again, drawing just 15.8 and 4.0 W respectively for power-on and standby. Interestingly, the power factor (ratio of real power to apparent power consumption) of the Sbooster was a somewhat unimpressive 0.5 when in use, slightly worse even than the internal switch-mode’s PF of 0.53 (where the ideal power factor is a figure of 1.0). The Longdog meanwhile recorded 0.78 PF, a result closer perhaps to what one might expect of a traditional linear supply. ‘DC/DC convertors operate on a high switching frequency and are generating high peak-loads which lead to instability of a conventional power supply design. Our split-current-technique solves this issue. The Split-current device literally divides the current in two parts. This didn’t make complete sense to me and after querying, Sbooster clarified that ‘low frequent is close to DC and high frequent is highly fluctuating’; although by referencing frequency with a DC output I still wonder if something has been lost in translation from the Nederlands. The latter point refers to an additional Ultra upgrade that Sbooster makes, although this does not work with the Mytek Brooklyn, among other units. The Sbooster hardware is neatly finished in a ventilated ABS plastic box, with choice of either silver- or gold-coloured inlay panel on top. There is one input for a standard C13 three-pin mains plug. The DC output power cable is hard-wired to the unit and 93 cm long. A selection of six detachable connector plugs allows use with a variety of different components. In line with most modern products, centre pin is positive. Outer barrels of these DC plugs measure 2.5, 3.5, 4.0, 4.8 and (2x) 5.5 mm. The two seemingly identical 5.5 mm plugs differ in their internal diameter, either 2.1 or 2.5 mm. The choice here proved useful, as while both Mytek and Chord DACs take the 5.5 mm standard, the Chord needs 2.1 mm internal diameter while the Mytek uses a 2.5 mm internal plug. In use, the Sbooster remained cool to the touch, and importantly ran silently, with no audible transformer hum or buzz. There’s no doubt that changing to the Sbooster wrought noticeable changes to the sound of the Mytek Brooklyn DAC in my system. When reviewed as-is, I found the Brooklyn to have a crisp and insightful sound, slightly more forward than the Stereo 192-DSD DAC it replaced, with exceptional low-level detail retrieval that contributes to an enjoyable and musical sound. Changing to the Sbooster PSU put the soundstage back again slightly, in what I now feel is a more natural position behind the line of the speakers. But the largest immediate difference must be the change in tone. The BOTW had a clear smoothing effect on the sound – treble was sweeter and less upset by noisy cymbals and electric guitars, while bass was warmer, more enveloping, as well as apparently deeper. This all made for an easier sound, closer to vinyl replay in fact, which can draw you more into the music. And that’s helped by better layering of the soundstage, revealing more front-to-back depth along with a better sense of the speakers melting out of the way of the performance. On the downside the added bass weight seemed to rob the sound of some pace, giving for example a slower, fatter bass in ‘Karmacoma’ [Massive Attack, Protection] that would trip up the rhythm. Other test tracks for bass pace and timbre revealed the same story, where increased bass weight and power using the Sbooster upgrade would with a small toll on bass precision and speed. That was running at 12 V. Switching to 13.2 V helped a little, subjectively bringing out more dynamic range as well as tidying the timing a tad. Further experiments suggested the best sound could be found when powered direct from a wall mains socket, rather than through any mains filters or distribution blocks. Now, some of the speed and timing experienced from the internal SMPS was preserved but with the smoother, blacker sound of linear PSU. Another over-achieving D-A convertor, the Chord QuteEX, now discontinued, was a development of the QuteHD I reviewed in 2013, the difference just an expanded format specification to 384 kHz PCM and 5.6 MHz DSD. The Sbooster again gave a darker backdrop than the supplied power plug (a basic wall-wart unit), smoothing out some ‘spitty’ vocals to give reduced lisp and sibilants. Bass again though could lose timing precision and with it pitch definition – ‘Karmocoma’ here had better vocal delivery but a wayward seismic bassline that tripped up the beat. The thickening effect was heard on other similar material, resulting in a slightly gloopy bass that could blur timing and perception of pitch. To be clear, these latter observations of timing are not huge effects, subtle changes in the flow of the music that I’m sure will not trouble many listeners. But for me the nebulous term ‘musicality’ has at its heart the essential rhythm and timing of music, which among other things can be narrowed down to leading and trailing edge note information: the ‘start’ and the ‘stop’ of every played note. As a bass player I can’t help but focus on LF pitch definition and timing, areas which are easily upset by a number of factors in any given system, including to a large degree as I’ve experienced before, power supplies, power cables and mains filters. Oftentimes, external linear supplies can be particularly sensitive to how they are connected to the mains supply in this respect, and experimentation with different strategies can be rewarding. Upgrade the sound without touching the hi-fi system? As alluded to earlier, it’s not just audio components that can be powered by an Sbooster BOTW P&P ECO. With its generous power rating of around 36 watt and handy array of different size DC plugs, it will also power a number of household technology appliances, such as wireless network routers, network-attached storage (NAS) drives, even complete PCs. By swapping out the high-frequency power supply supplied with any such products, it’s possible to eliminate another potential source of air- and mains-bourne RFI in the home. For computer audio enthusiasts relying on all three of the above, and likely in close proximity to the hi-fi system, there’s plenty of scope here for more improvments in sound quality. Simple listening tests were tried on a second system in the house, based on a Cambridge Audio network streamer, Leema Acoustics Tucana integrated amplifier, Mytek Stereo 192-DSD DAC – and a Netgear wireless router, pressed into service in the room as a network switch and Wi-Fi range extender. The Netgear R7000 [reviewed here] is one of the company’s better routers and like all such appliances it’s supplied with a simple external wall-wart, and usefully the router also requires 12 V DC. Before and after powering by Sbooster, I didn’t find an obvious difference like that found by changing the DAC power supply, but after repeated swaps between linear and switch-mode supplies, over a period of time, I’m convinced I can now hear the effects of even this single wall-wart in the system. Unplugging SMS and using the Sbooster instead to power the router, a faint layer of ‘haze’ is removed from the sound, making a more natural rendering of instruments and voices, where it’s easier to separate closely overlapping sounds. The sound before was far from ‘fizzy’ but afterwards there is a darker, smoother tonality that is most welcome. If there were several SMS-powered devices in the room, I’d imagine changing all to linear power would compound the subjective improvement. The Sbooster BOTW P&P ECO is a well-made and versatile unit that brings instant dividends to a system using commodity power plugs. With both D-A convertors I tried, it tamed the sound conspicuously, taking out some of the ‘digital’ glare that even the best DACs for the money will still show. It can also serve good duty as a power supply of ancillary non-hi-fi components, with subtle improvements in system sound available by nipping the source of external RFI in the bud.